**ESSENCARE PREMIUM AUTHENTIC JADE ROLLER MASSAGER ANTI-AGING TREATMENT using the highest quality jade. This powerful stone has been used for healing by Eastern traditional cultures for thousands of years. It emits energy waves of a special nature. They penetrate deep into tissues to stimulate circulation, create a healing energy process, and encourage better use of nutrition. Jade can heal face and skin to eliminate wrinkles, fine lines, crows feet, and other signs of aging. Your skin becomes younger and helps you roll back the years to look more youthful. Use this jade roller for a few minutes each night before bed. Then get ready for all the compliments you're going to get! **TRANSFER POSITIVE ENERGY INTO YOUR BODY Jade has a remarkable power to fill your room and body with positive energy. It's good for driving away the blues and depression so you see possibility and happiness in all the places it hides. Many people use the roller in the morning to get their day started on a positive note. Can help encourage better sleep and positive dreams. **NO HASSLE MONEY BACK GUARANTEE ensures this will be your best bet for a no-risk purchase. Many customers love the jade roller so much they buy another for a friend. HURRY UP AND TREAT YOUR SKIN WITH ESSENCARE ROLLER while we have a new shipment in stock. This makes a much appreciated gift for friends, family, and co-workers - anyone who wants to look younger naturally without drugs or surgery! 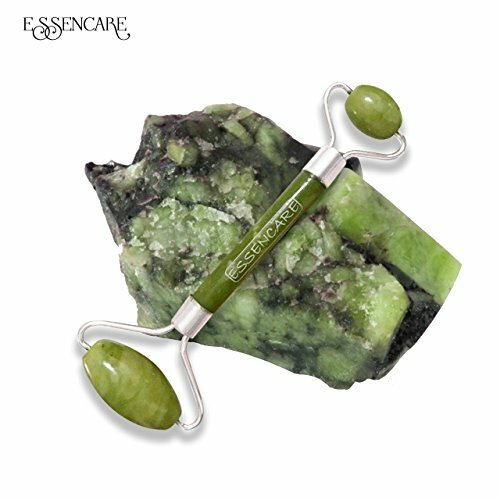  PREMIUM AUTHENTIC JADE ROLLER made with the Highest Quality Real Jade Stone from EssenCare. Rolling over facial and body skin to massage and reduce wrinkles. Jade has been used and proven for thousands of years in the Far East. Oriental Women have been utilized Jade to make them look younger, stay beautiful, to keep their skin healthy and slow down aging process. Use regularly everyday for a noticeable improvement.  SAY BYE TO WRINKLES BY SMOOTHING FINE LINES and tightens skin by using EssenCare Jade Roller. EssenCare guarantees to give you a more youthful appearance. Lots of people have been using our roller few minutes per day for few months swear they look years younger. EssenCare Premium Jade Roller enhances your beauty, boosts your confidence to live life to the fullest.  REJUVENATES AND HEALS SKIN. Helps improve blood circulation by sending beneficial energy waves through to deep tissues. Jade has the ability to naturally heal skin to make it healthy with better circulation and use of nutrients. Try placing your jade roller in the fridge for 10 minutes prior to use for an even more refreshing feeling.  IMPROVES MOOD, CREATES POSITIVE ENERGY all around you. Notice how much better you feel after a minute or two with the jade roller. This special crystal is known for filling people with positive energy that helps dissipate anxiety, stress while creating healing relaxation. If you have any questions about this product by EssenCare, contact us by completing and submitting the form below. If you are looking for a specif part number, please include it with your message.